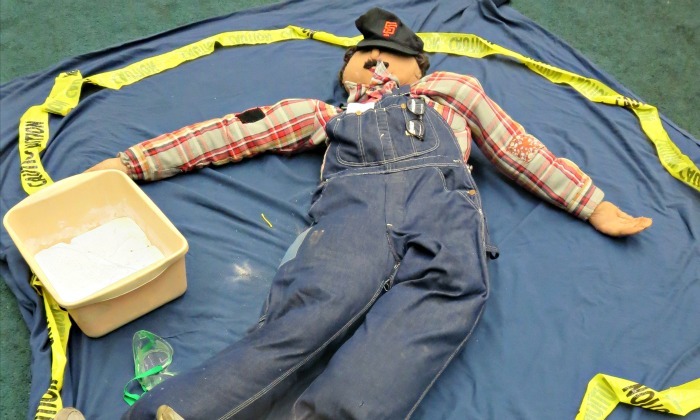 Are your kids interested in what crime scene investigators do? 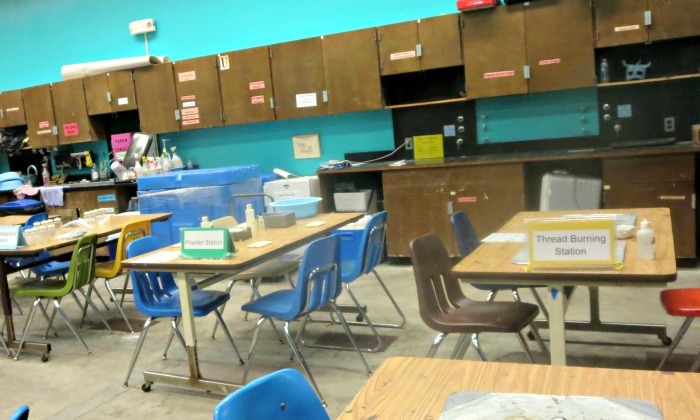 If you feel ambitious, you can build your own forensic science workshop or CSI-themed birthday party, but we were lucky to attend a crime scene investigation science workshop for kids run by Lawrence Hall of Science. CSI Workshop was the last workshop in our Science Day organized by Hopkins Center for Talented Youth. 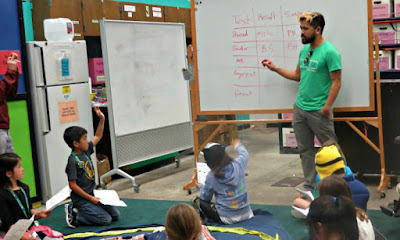 I already wrote about hands-on neuroscience for kids and exploring dry ice before. After lunch the kids entered the next room and met Clyde. I was worried for a moment how they are going to react to the “body”, but everyone in the group was grade 4 and up, the room was brightly lit, and the “corpse” was clearly a dummy. The instructor introduced everyone to Clyde and told them a mystery story that involved 6 suspects. 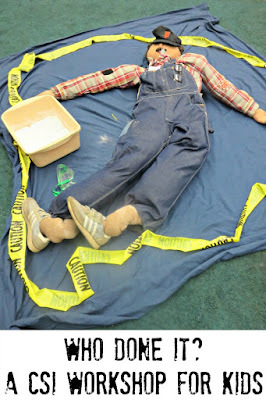 Then he invited students to inspect the crime scene where the kids noticed a white substance, a piece of thread, a note written in ink (the note said, I am too smart for you and you will never catch me!). The more observant students also noticed a footprint and a fingerprint on the goggles left on the crime scene. Mystery powder station had the following set up. The kids were given a “mystery powder” from the crime scene, and 6 other labeled white powders – baking soda, salt, flour, cornstarch, sugar, and, I think, crushed chalk. They were also told that each suspect had access to different combinations of two out of six powders, and they were listed in their printout. 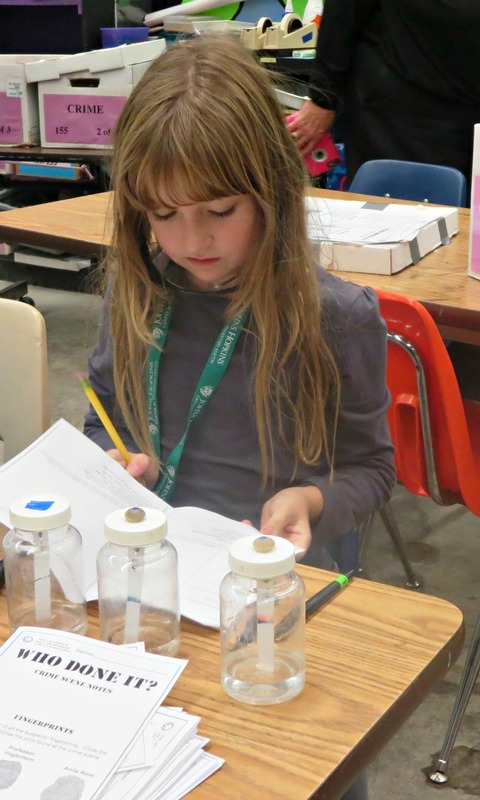 The station had water and vinegar available, and the kids had to identify a mystery powder by observing its reaction to water and vinegar in comparison to known substances. Of course, the mystery powder turned out to be baking soda, and Smarty zeroed in on this possibility right away, since we did a similar “mystery substance” experiment once at home. At chromatography station, the kids were given a sample of writing from the crime scene and then they had to test different pens on coffee filter paper and compare their chromatography “footprint” with the one from the crime scene. Again, each pen might have belonged to two suspects. If you are not familiar with chromatography experiments, check these fun chromatography butterflies from Buggy and Buddy. Smarty thought that thread burning station was the coolest, since she does not get to burn stuff at home often enough. Sadly, I didn’t take pictures from this station because it was so crowded. It was also the most difficult station, because the kids were given again labeled threads (wood, acrylic, cotton, and silk) and were asked to observe how they burn and how their ash looks like in comparison to a mystery thread. Of course, they were given tongs to hold their threads over alcohol lab burners and protective eye gear for all stations. In the end of the class, the kids summarized their findings through the elimination matrix, and found the suspect. I liked the instructor’s thoughts in the end – he explained that while criminal scene investigation has an important role in solving crimes, it does not always give clear answers or even right answers. He stressed that detective work in finding a motive and questioning witnesses is as important. He also stressed that scientists do not find people guilty of crime – only courts can do that and sometimes they disregard scientific evidence (no, he did not mention O.J. Simpson’s trial). Kids certainly learned more than simple science from this workshop! Have you done any cool science lately? 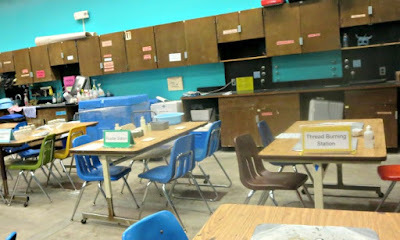 Doing another crime scene lab is on my list of things to do someday. My kids loved the one we did. Hmm we are doing more art than science lately, but soap making at my son's birthday party was a hit. Awesome idea for the budding detective! My kids loved it too! I was hoping to find a resource for creating some for Christmas, but so far no luck! Such an interesting look at science! I know that would have kept me interested as a kid. Thanks for a good read.